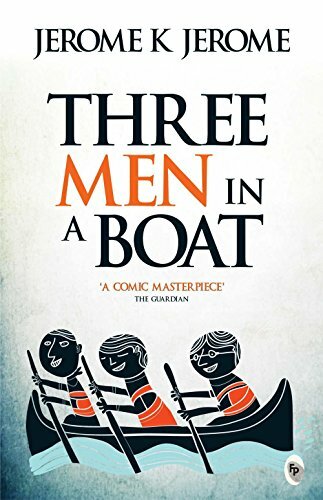 'Three Men in a Boat' is a comical account of a journey undertaken by three friends up the Thames river. It was written and published in 1889. While intended to be a travelogue and a guide to prospective travelers wishing to explore the river, it is better known and remembered for its comical nature and hailed as one of the best comic literature written in English. I have stood and watched it, sometimes, when you could not see any water at all, but only a brilliant tangle of bright blazers, and gay caps, and saucy hats, and many-coloured parasols, and silken rugs, and cloaks, and streaming ribbons, and dainty whites; when looking down into the lock from the quay, you might fancy it was a huge box into which flowers of every hue had been thrown pell-mell, and lay piled up in a rainbow heap, that covered every corner. Marlow is one of the pleasantest river centres I know of. It is a bustling, lively little town; not very picturesque on the whole, it is true, but there are many quaint nooks and corners to be found in it, nevertheless - standing arches in the shattered bridge of Time, over which our fancy travels back to the days when Marlow Manor owned Saxon Algar for its lord, ere conquering William seized it to give to Queen Matilda, ere it passed to the Earls of Warwick or to worldly-wise Lord Paget, the councillor of four successive sovereigns. There is a lovely country round about it, too, if, after boating you are fond of a walk, while the river itself is at its best here. Down to Cookham, past the Quarry Woods and the meadows, is a lovely reach. Dear old Quarry Woods!... From Marlow up to Sonning is even fairer yet. Grand old Bisham Abbey, whose stone walls have rung to the shouts of the Knights Templars, and which, at one time, was the home of Anne of Cleves and at another of Queen Elizabeth, is passed on the right bank just half a mile above Marlow Bridge. Second problem is the characters themselves. They are too atypical in their typicality. The characters, George, Harris, J, and Montomorency are all peculiar templates - all representative of what I would call the upper-middle-class gentry with its quirks exaggerated to the maximum. Or perhaps not, and pardon the dog for the dog's actions have been interpreted by the men of the mentioned class. "Why not?" is something I am unable to elucidate. They bring to life in barely three characters, the assorted quirks of a characteristic being. And it is scary that I find a lot of them in myself, which made it pretty hard for me to enjoy myself when they first manifested in the course of the read. On one hand, it is a reflection of the fickleness of human psyche and how color and context changes the perception. On the other, it is a proof of our capacity to have a good time despite the odds (and the ignorance of our ignorance, and sometimes, arrogance). Had it not been its preface and the discussion on Reddit that had made me read the book in the first place specifying that the book is comical, I would have felt constant frustration and confusion while dealing with the character of J. For in him, I sometimes saw too much of myself, and it was not amusing. (I am also told that the trio represents a typical Englishman which, of course, is little solace) The three are smarty pants - who think that only they (each one to himself) have everything figured out (and it turns out to be not so). I rather pride myself on my packing. Packing is one of those many things I feel I know more about than any other person living. (It surprises me myself, sometimes, how many of these subjects there are.) I impressed the fact upon George and Harris, and told them that they had better leave the whole matter entirely to me. They fell into the suggestion with a readiness that had something uncanny about it. George put on a pipe and spread himself over the easy-chair, and Harris cocked his legs on the table and lit a cigar. This was hardly what I intended. What I had meant, of course, was, that I should boss the job, and that Harris and George should potter about under my directions, I pushing them aside every now and then with, "Oh, you-!" "Here, let me do it." "There you are, simple enough!" - really teaching them, as you might say. Their taking it in the way they did irritated me. There is nothing does irritate me more than seeing other people sitting about doing nothing when I'm working. Now, I'm not like that. I can't sit still and see another man slaving and working. I want to get up and superintend, and walk round with my hands in my pockets, and tell him what to do. It is my energetic nature. I can't help it. We had just commencd the third course - the bread and jam - when a gentleman in shirtsleeves and a short pipe came along, and wanted to know if we knew that we were trespassing. We said that we hadn't given the matter sufficient consideration as yet to enable us to arrive at a definite conclusion on that point, but that, if he assured us on his word as a gentleman that we were trespassing, we would, without further hesitation, believe it. Sounded like fun, something like the characters from Dumb and Dumber. Only after having read it in context did I realize that it was a part of something bigger, more than just a mouthful. Besides, J is highly digressive and wanders off with his wistful reminiscing of experiences that he had had, some pleasant and some, cheekishly embarrassing. It took a while to accept this affront and to get used to the digressive and colored stories of the three - stories where they were brilliant, or where they were totally a victim of circumstance. Soon, one learns to even enjoy them, while mellowing out the braggarts - separating the real event from the circumlocution. By the end of the book, when one is fairly sure one can live with these guys, it is then that the three finally and abruptly have had enough. Now that it is done, I thought I would say I did not enjoy it. But, every time I open the book, I wish to tell you more about it - you know, like ... gossip? It even feels amusing now, to open up to a random page and start reading - faintly recollecting it and now, better appreciating the irony or the comedy in the situation. Much like life, no? Bittersweet memories of what used to be. I think I will return to it occasionally. The characters have grown on me like friends, and their actions make me smile and laugh. They remind me of my own friends and also that time and technology seldom change how friends behave among friends. I'll leave you with an excerpt on how J thought he had all the known diseases and how he felt indignation at being deprived of one of them. It is surprisingly accurate and amusing. Because I must know, I might say I fancy having it and I pray that I don't. I remember going to the British Museum one day to read up the treatment for some slight ailment of which I had a touch hay fever, I fancy it was. I got down the book, and read all I came to read; and then, in an unthinking moment, I idly turned the leaves, and began to indolently study diseases, generally. I forget which was the first distemper I plunged into some fearful, devastating scourge, I know and, before I had glanced half down the list of premonitory symptoms, it was borne in upon me that I had fairly got it. I sat for awhile, frozen with horror; and then, in the listlessness of despair, I again turned over the pages. I came to typhoid fever read the symptoms discovered that I had typhoid fever, must have had it for months without knowing it wondered what else I had got; turned up St. Vitas’s Dance found, as I expected, that I had that too, began to get interested in my case, and determined to sift it to the bottom, and so started alphabetically read up ague, and learnt that I was sickening for it, and that the acute stage would commence in about another fortnight. Bright disease, I was relieved to find, I had only in a modified form, and, so far as that was concerned, I might live for years. Cholera I had, with severe complications; and diphtheria I seemed to have been born with. I plodded conscientiously through the twenty six letters, and the only malady I could conclude I had not got was housemaids knee. I felt rather hurt about this at first; it seemed somehow to be a sort of slight. Why hadn’t I got housemaids knee? Why this invidious reservation? After a while, however, less grasping feelings prevailed. I reflected that I had every other known malady in the pharmacology, and I grew less selfish, and determined to do without housemaids knee.